Robin Thodey was born in New Zealand and commenced her musical studies at the University of Canterbury in Christchurch. Upon moving to London, she continued her studies at the Guildhall School of Music and Drama, gaining her Licentiate diploma. At the same time, her academic inclination led her to enroll at London University in the Department of Theology at King’s College from which she obtained the degree of Bachelor of Divinity. Returning to music, she travelled to Italy and France, participating in master classes at the Academia Chighiana, in Seina, Italy, and the Deller Academy in Lacoste, France. For four years she taught the lute and guitar in the Department of Music at York University, England. Robin Thodey made her American debut April 29th, 1992 at Carnegie Weill Recital Hall in New York. Until her death, Robin Thodey continued her public performances in England and abroad giving varying recitals. 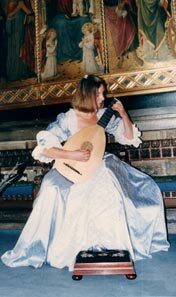 In addition to solo recitals, Robin frequently performed lute-song repertoire of renaissance England. John Dowland, Thomas Campion and John Danyel, and also rarely heard songs for guitar from the Viennese period by Mozart, Beethoven, Schubert, Spohr, and Guiliani are included in her recitals. She has transcribed the six Cello Suites of J. S. Bach for baroque lute and performs these as well. Click Here for Accomplishments and Performances. Click Here To find out more about recorded lute songs.